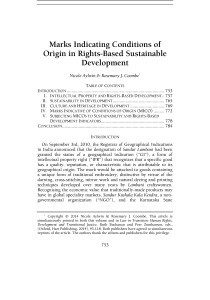 “Marks Indicating Conditions of Origin in Rights-Based Sustainable Development” (with Nicole Aylwin), University of California, Davis Law Review 47(3): 753-786. Simultaneously published in In Per Zumbansen & Ruth Buchanan, eds., Law in Transition: Human Rights, Development and Transitional Justice (Oxford: Hart Publishing, 2014), 97-118. Abstract: A geographical indication (GI) is an intellectual property right (IPR) that recognizes that a specific good has a quality, reputation, or characteristic that is attributable to its geographical origin. GIs and marks indicating conditions of origin (MICO) have the potential to catalyze economic development in rural and indigenous communities while simultaneously protecting their unique traditional knowledge and culture. The juncture of IPRs and development has seen the emergence of a rights-based normative framework at levels of theory and practice. The growing use of these forms of IPR in developing countries towards advancing sustainable community development legitimacy needs to be evaluated in terms of the qualities of empowerment, governance, and the sustainability of local livelihood improvements that MICO initiatives potentially enable. In short, rights-based sustainable development indicia provide promising ways to evaluate MICO initiatives, while also suggesting that further promotion of MICOs for development demands a commitment to rights-based criteria if it is to avoid reproducing old forms of privilege or perpetuating new forms of injustice.